Surge Narrows Provincial Park is located on the south end of Maurelle Island, east of Quadra Island off central Vancouver Island. With its high tidal changes and many reefs, this park has ideal conditions for marine life. Sea urchins, sea cucumbers, sea stars and anemones flourish in these prime conditions. These tidal currents are also notorious for their strength, particularly at Surge Narrows on the east and Seymour Narrows on the west. 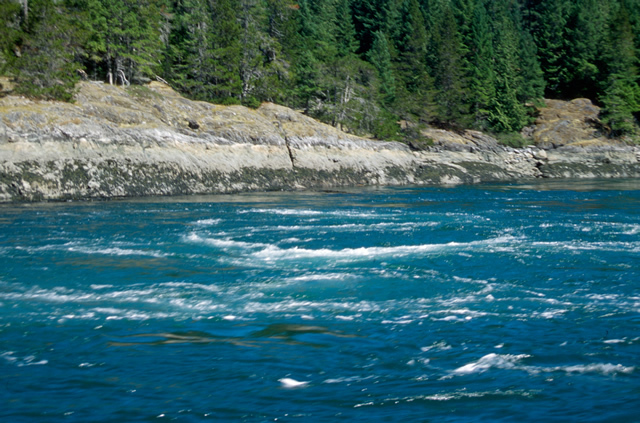 Paddlers should avoid Seymour Narrows and only travel through Surge Narrows at slack tide. Paddlers and boaters should also be familiar with tidal current charts so they can safely explore the rich waters around Surge Narrows Park. Only very experienced kayakers should attempt to paddle in the fast-flowing and treacherous tidal streams at Surge Narrows – currents can flow through this area at 16 knots and up to 14 knots on the ebb. Random wilderness camping is permitted on the upland portions of the park, which is undeveloped and has no facilities. A unique feature of this park are the tidal rapids caused by the convergence of two flood tides. This natural occurrence, located in the middle of the park, gives the park its name. The waters around this park are subject to very high tidal runs. Anyone accessing the park should consult current tidal charts. Surge Narrows is located on the south end of Maurell Island (east of Quadra Island), off central Vancouver Island. The park is accessible by boat only. From the north, access is through Okisollo Channel; from the South use Hoskyn Channel. Boaters can reference marine chart #3537 and #3539 from more information about this area. Nearby communities include: Campbell River, Quadra Island, Cortes Island, Discovery Islands. Approved Purpose Statement and Zoning Plan [PDF] for Surge Narrows Provincial Park is available in pdf format. There are opportunities for canoeing or kayaking in this park for experienced paddlers only. Paddlers should avoid Seymour Narrows and only travel through Surge Narrows at slack tide. Paddlers and boaters should also be familiar with tidal current charts so they can safely explore the rich waters around Surge Narrows Park. Only very experienced kayakers should attempt to paddle in the fast-flowing and treacherous tidal streams at Surge Narrows - currents can flow through this area at 16 knots and up to 14 knots on the ebb. This park offers opportunities for ocean fishing - rock fish and salmon are the main species. Fishing is permitted as per provincial and federal fishing regulations. Rockfish Conservation Areas occur within this park. Fishing activities are limited in Rockfish Conservation Areas. Before you go fishing please refer to the Rockfish Conservation Area descriptions available from Fisheries and Oceans Canada DFO. Anyone fishing or angling in British Columbia must have an appropriate licence. While small fires are allowed, we encourage visitors to conserve the environment by minimizing the use of fire and using stoves instead. If you do have a fire, please utilize previously constructed fire rings and use small pieces of wood that will burn completely. If you can't find a previously used site, try to construct your fire rings below the high tide mark. Never leave your fire unattended and practice “Leave No Trace” camping ethics. There are no designated campsites at this park, however random wilderness camping is allowed. No facilities are provided and there is no fee. Please practice “Leave No Trace” camping ethics. This park is accessible year-round; there is no winter camping fee. This park is accessible year-round; there is no winter camping fee.